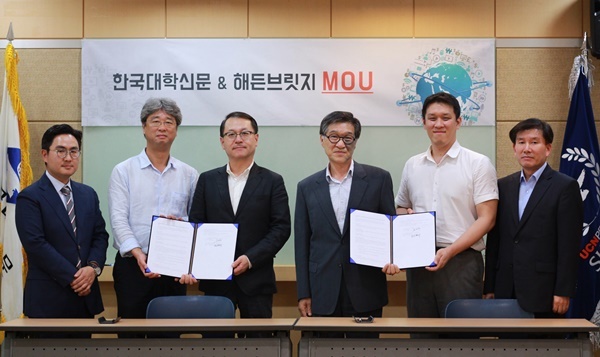 Haeden Bridge Co., Ltd. (CEO Namgung Hwan-sik), a immersive visual communication solution developer, took a hand on 29th to strengthen the competitiveness of video solutions in university society. Haeden Bridge is a software-based visual communication solution provider that provides a variety of business models for video and video-conferencing, large-scale interactive webinars, telepresence and real-time e-learning. They have recently developed a new concept of Media Processing System (MPS), which enables a large-scale image collaboration service, and are in the forefront of entering the global market with a new product TOMMS equipped with the new MPS. On the day of the ceremony, Namgung Hwan-sik(Haeden Bridge CEO), Im Dong-pil(Haeden Bridge director), Kim Young-woong(LKMA representative), Jeon Ho-joon(LKMS team leader), Son Eun-you(LKMS team leader), Hong Nam-suk(Representative of Daily UNN), Park Sung-tae (Daily UNN Publisher), Lee Jae-kyu(Daily UNN Director) and Hong Jun(Campus Life Representative) attended this agreement ceremony.